The Cancer Clinical Trials Office (CCTO) at Stanford University, Palo Alto, CA, oversees a large clinical trials program. The 2015 European Cancer Congress (ECC 2015) was held in Vienna, Austria, from September 25 to 29. The congress was jointly sponsored by the European CanCer Organisation (ECCO) and the European Society for Medical Oncology (ESMO). Results from a new study provide reassurance to women with cancer during pregnancy that they can be safely treated during the second or third trimester with chemotherapy/radiation without compromising their unborn child. 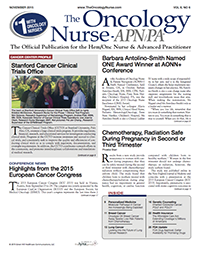 The Oncology Nurse-APN/PA (TON), we feature Stanford Cancer Clinical Trials Office. Andrea F. Plati, MSN, RN, OCN, Associate Director of Clinical Research Operations, took the time to speak with us about her role, challenges, and exciting trials she is undertaking. The study of cancer survivorship includes the impact of cancer on family members, friends, and caregivers. Here is some information on a few aspects of cancer survivorship. At the 16th Annual International Lung Cancer Congress, Tony Mok, MD, Professor of Clinical Oncology at the Chinese University of Hong Kong, provided an overview of the next generation of agents, taking stock of the recent past for insights into the future of drug discovery. Patients with early breast cancer and a low Oncotype DX Recurrence Score (RS) can be safely treated with hormone therapy alone and avoid chemotherapy, according to results of the National Cancer Institute–sponsored Trial Assigning Individualized Options for Treatment (Rx), or TAILORx trial.